Buckland in the Moor has for many years been on the route of the visitor’s ‘grand tour’ of Dartmoor. Many people coming to see the famous ‘chocolate box’ thatched cottages and dream about living in such an idyllic spot. The ironic thing is that if ever anyone was fortunate enough to live in such a house they would have to put up with hundreds of other people gawking at their home wishing they could live there – not what you could call privacy. This small moorland church stands majestically on top of the hill and looks out over splendid wooded views of the Webburn valley. Here Saint Peter stares westwards into the eyes of Saint John, the two holy men seem to stand guard over the valley. Why? 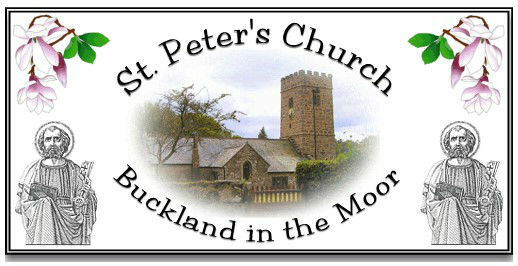 because the church at Buckland is dedicated to Saint Peter and to the west is the church at Leusdon which is dedicated to Saint John.